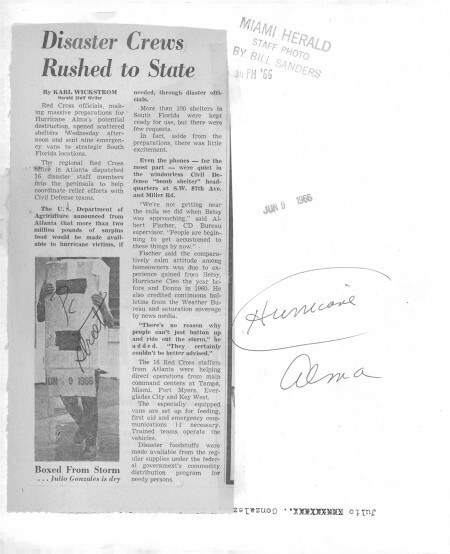 8/10/1955, Lyle Byland/Miami Herald: Hurricane Connie has blown past Florida and with it has gone The Herald's supply of hurricane maps. Requests for the free plotting charts completely exhausted the first printing. 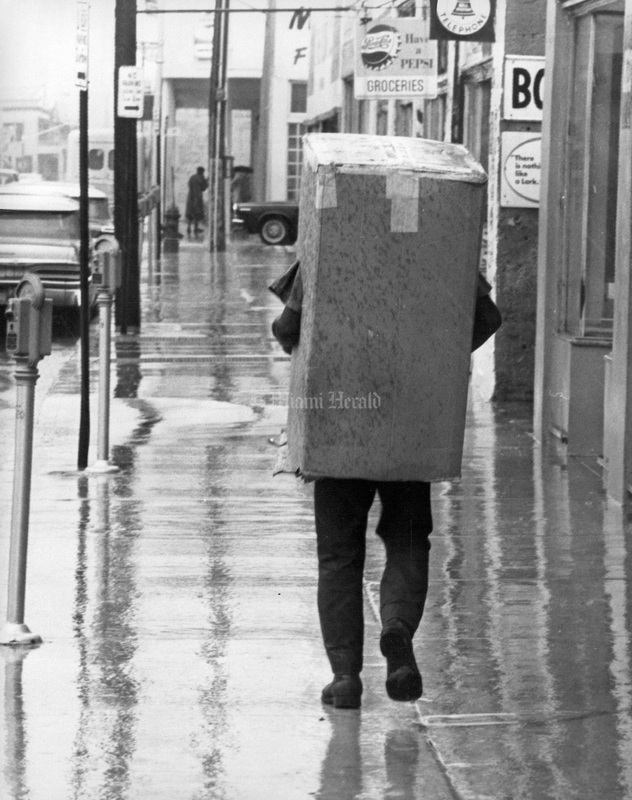 Hundreds of orders piled up Tuesday with each mail bringing in new ones from readers all over the nation. 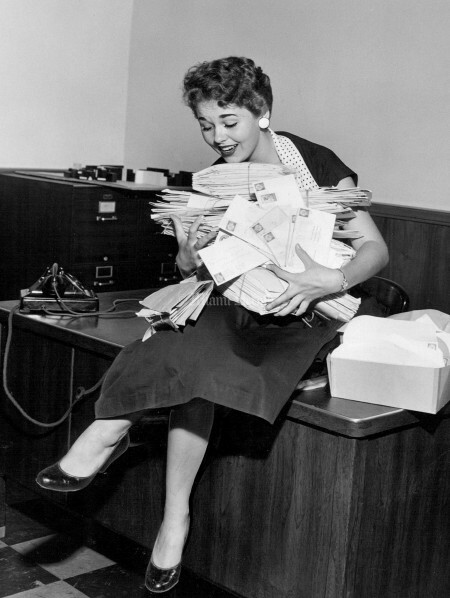 Herald copy girl Pat Case displays some of the incoming mail. A new supply of the maps is expected soon. 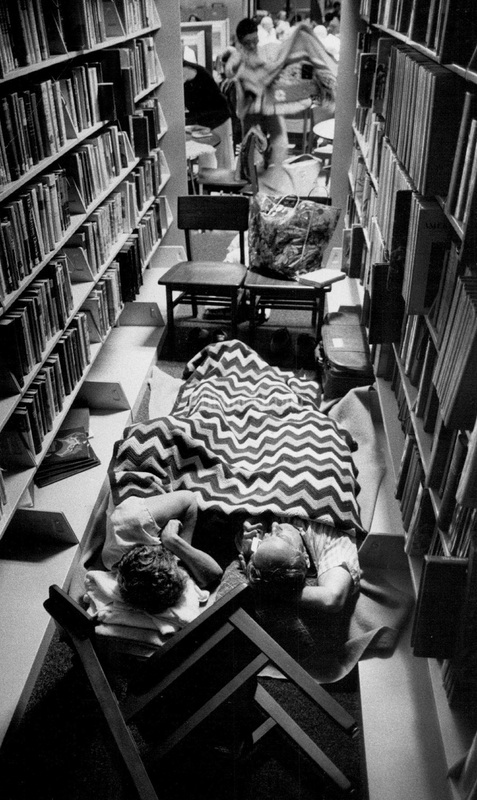 The requests will be filled as rapidly as possible. 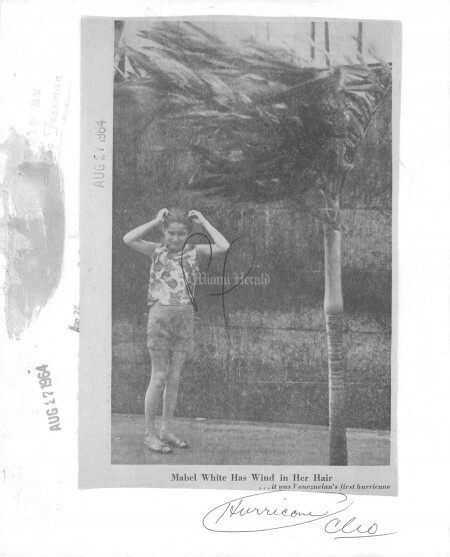 8/27/1964, Mike Freeman/Miami Herald: Mabel White Has wind in her hair...it was her first Hurricane. 6/8/1966, Miami Herald: Hurricane Alma, N. Miami Ave at 9th St.
6/8/1966, John Pineda/Miami Herald: Fascinated by the fury of approaching Hurricane Alma, young and old watch the storm from the safety of the storm shelter at Naples Junior High School. 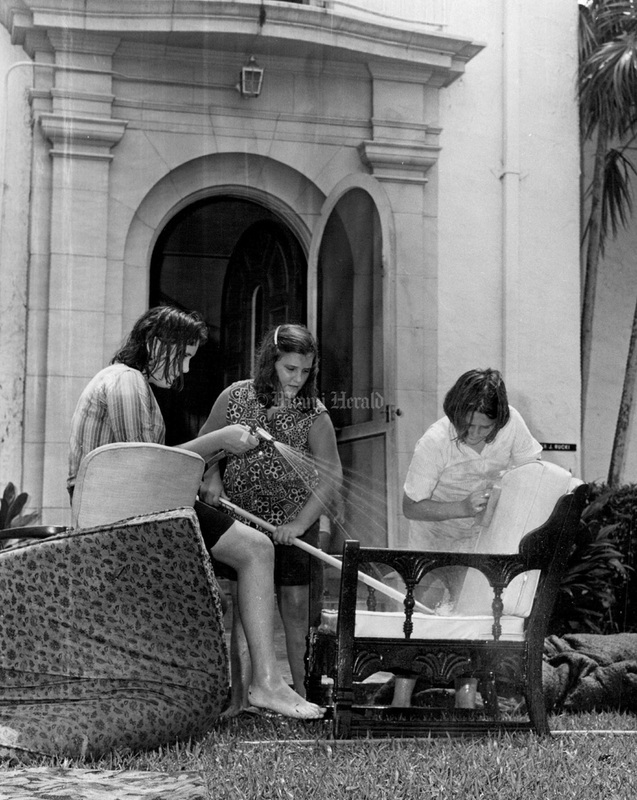 6/1966, Bill Sanders/Miami Herald: Boxed from storm . 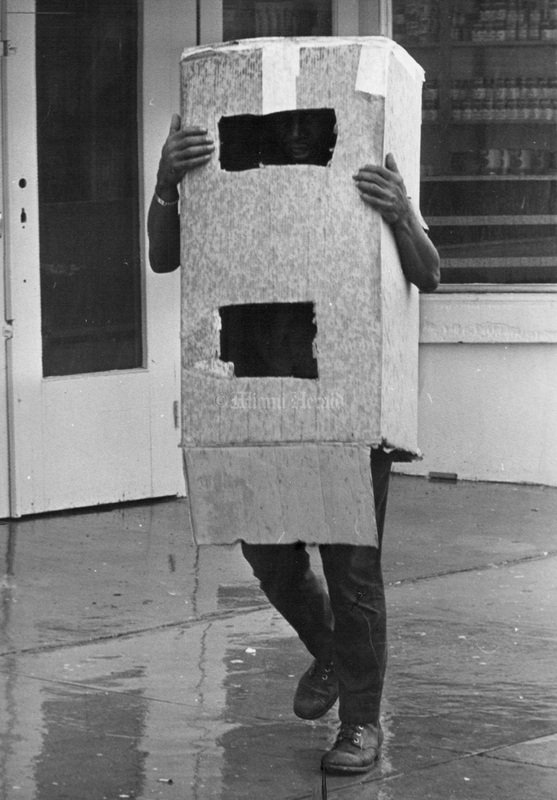 . . Julio Gonzales is dry. 9/8/1965, Albert Coya/Miami Herald: The "Cliques" a swinging combo entertain kids at Coral Park shelter during hurricane Betsy. 9/9/1965, Albert Coya/Miami Herald: Janice Marks and Ronnie Walters at 83 St & 19 St, Westchester. 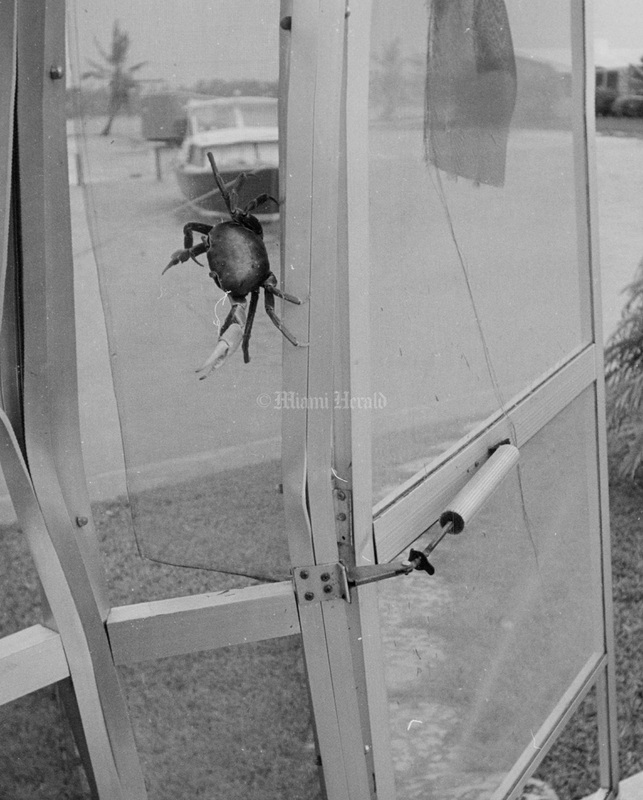 9/8/1965, Miami Herald: Crab climbing away from water at Gables by the sea. 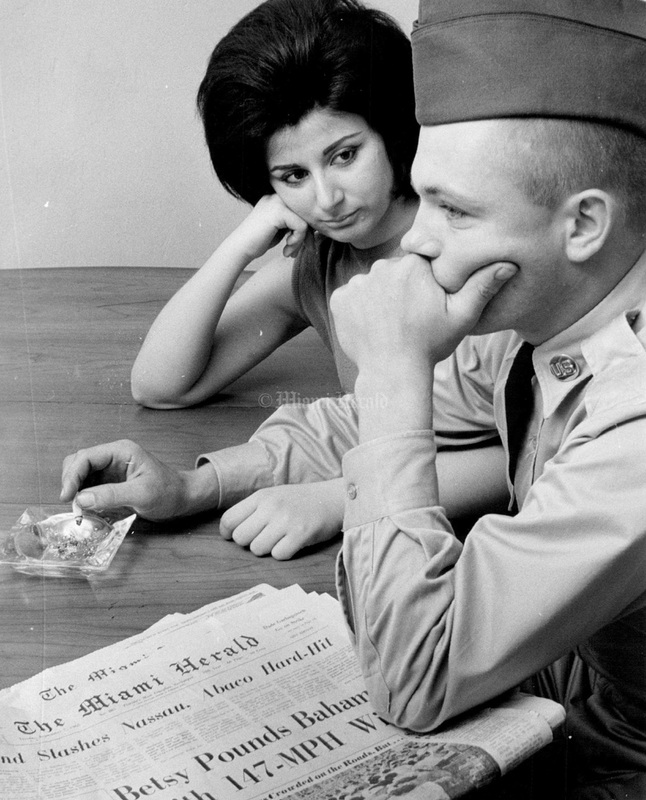 9/7/1965, Joe Lippincott/Miami Herald: Joanne Tropia and William Danahey ponder uncertain marriage. 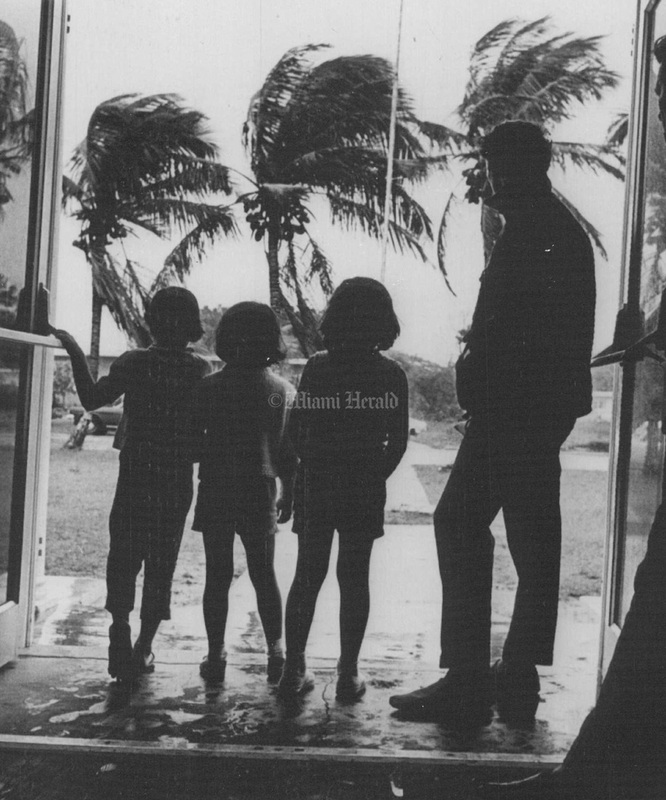 Hurricane Betsy is putting a damper on their wedding day. 9/9/1965, Wayne Warren/Miami Herald: Jolie, Carol and Bonnie Rucki wash salt water off their chairs after Hurricanie left three feet of water in their house. 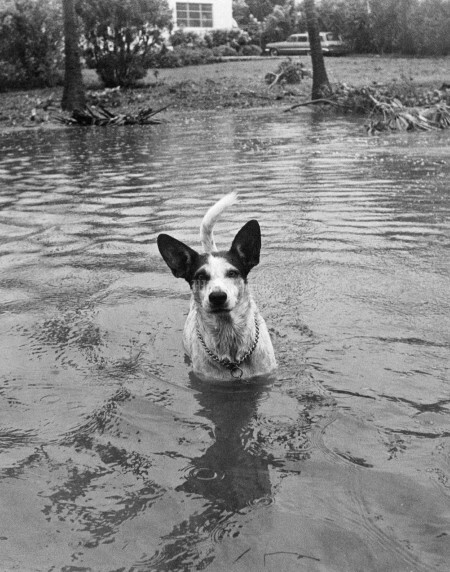 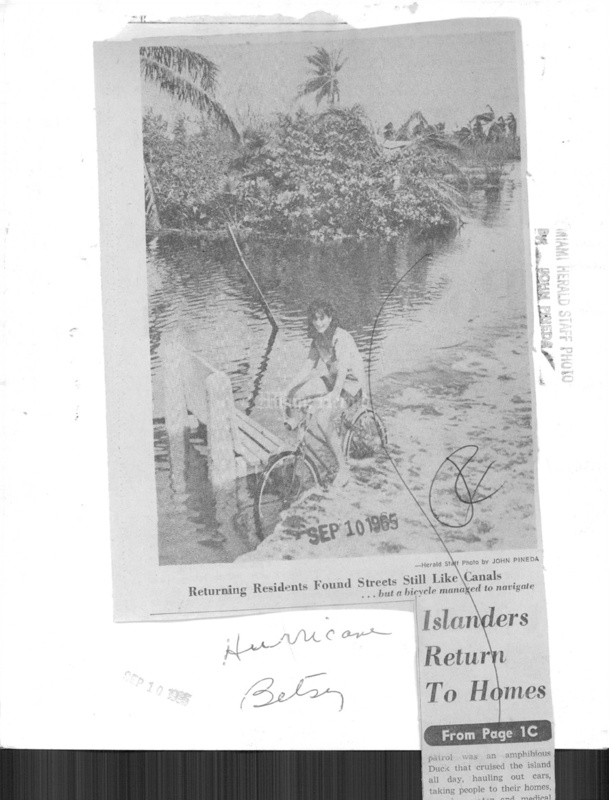 9/8/1965, Eamon Kennedy/Miami Herald: Dog seen on Douglas Rd in Cocoanut Grove. 9/10/1965, John Pineda/Miami Herald: Returning residents found streets still like canals, but a bicycle managed to navigate. 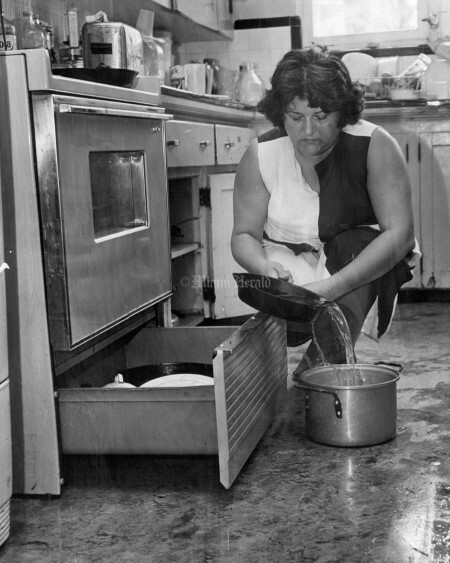 9/9/1965: Mrs. Walter J. Rucki empites brine... sea water filled pots and pans. 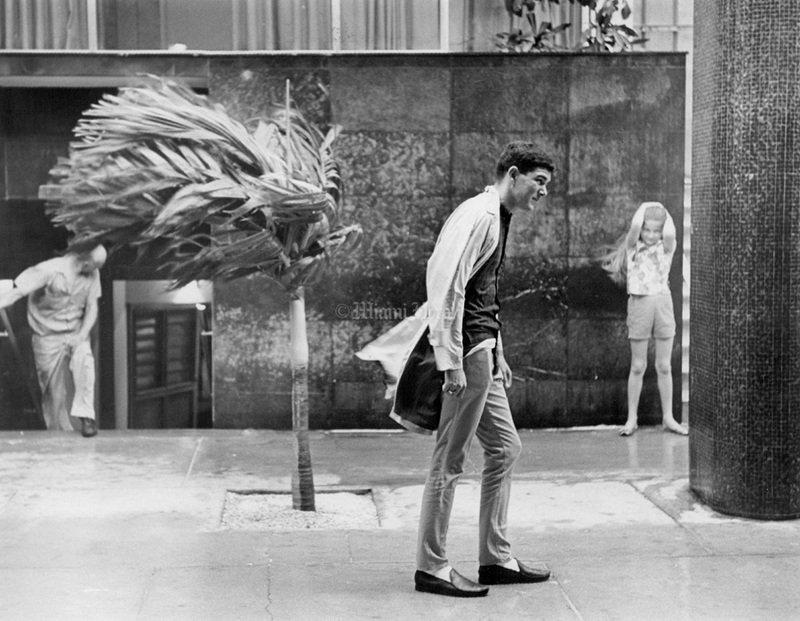 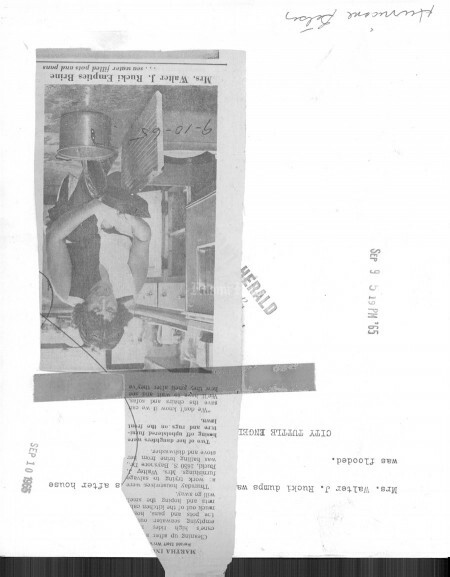 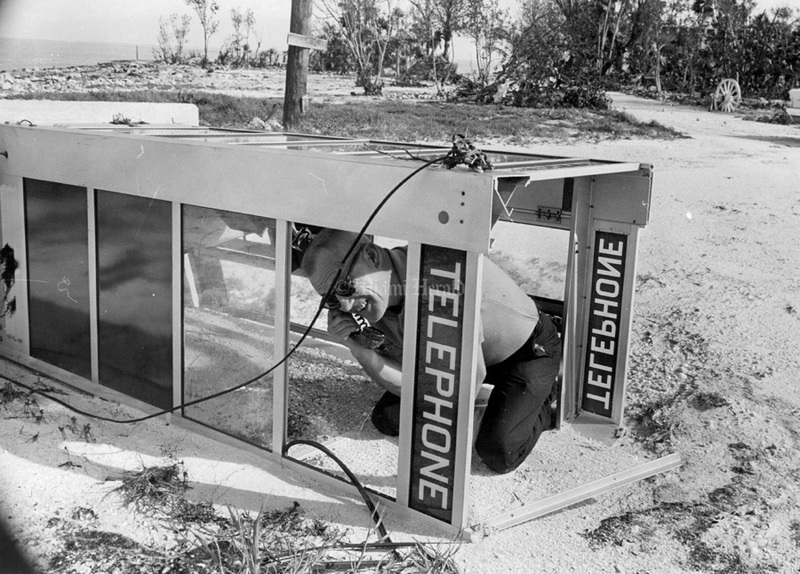 9/9/1965, Bill Kuenzel/Miami Herald: Phone booth toppled by Betsy.... caller makes the best of things. 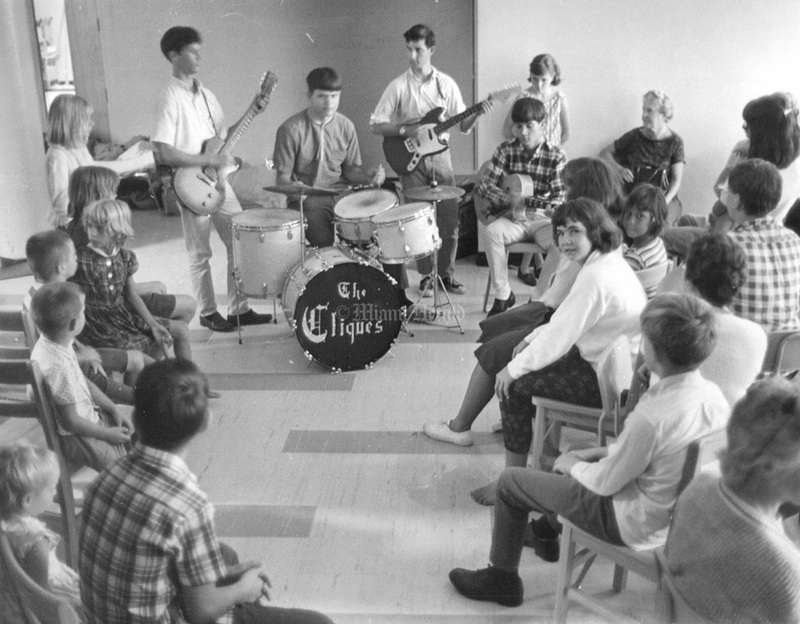 9/7/1965, C.A. 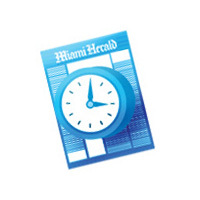 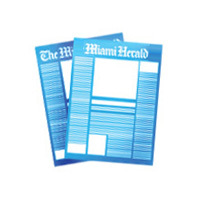 Mitchell/Miami Herald: Fringe Benefit. 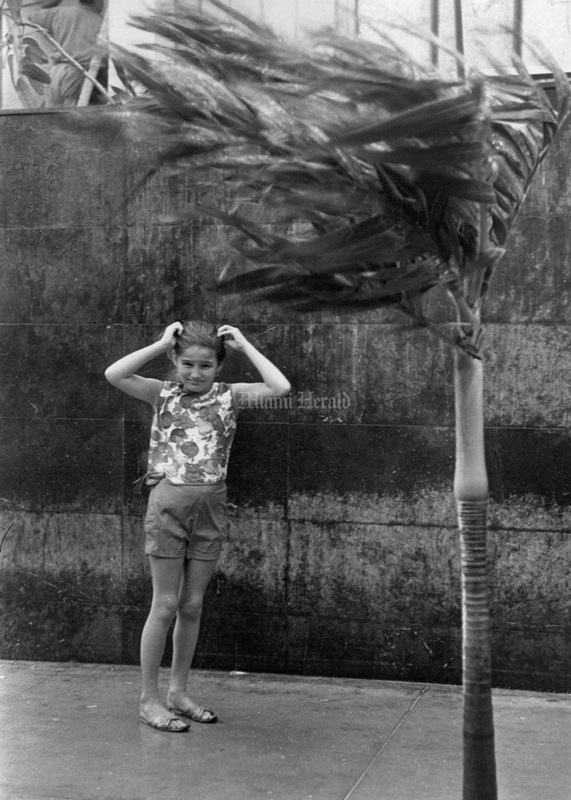 These youngsters found an ill wind blowing a bit of good Monday as the effects of Betsy were felt in Dade County. 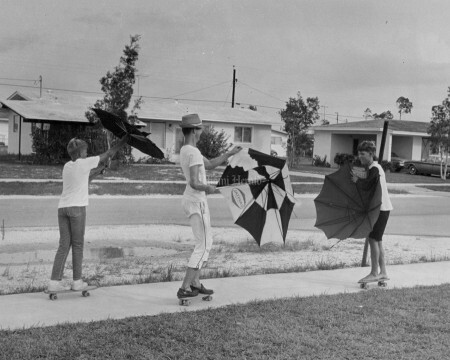 They put the breezes - and their skateboards and umbrellas - to good use near Cutler Ridge Junior High. 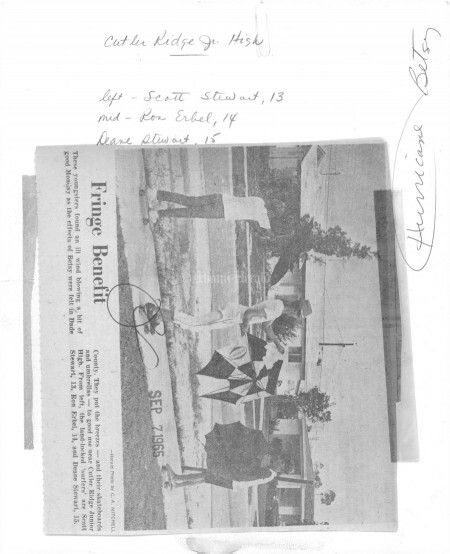 From left, the land-locked 'surfers' are Scott Stewart, 13, Ron Erbel, 14, and Deane Stewart, 15. 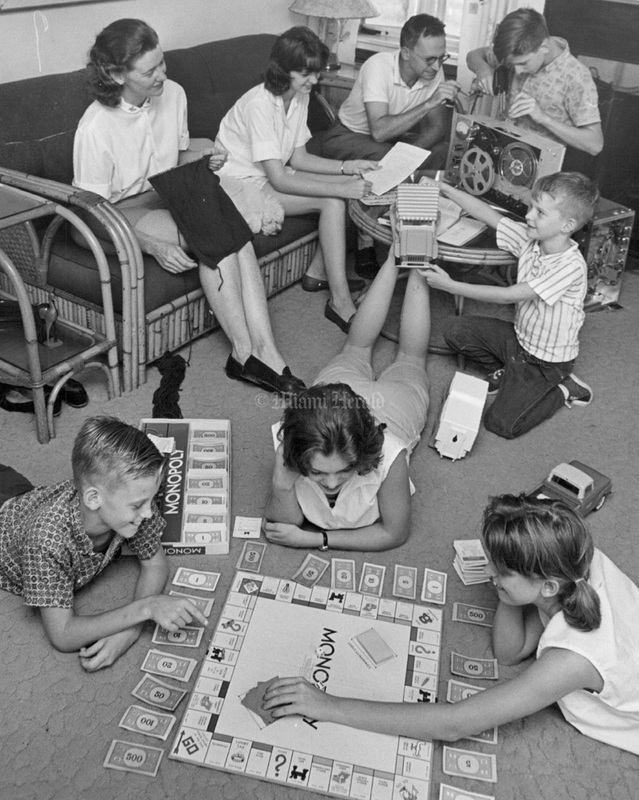 9/7/1965, Bob East/Miami Herald: Playing Monopoly are Donald, 10 Janice 15, Jane 13, Mrs. Grenleaf Knits, Joanna 16 Studies, pappa Don Greenleaf helps Sanley 14 repair church sound system and Paul 6 plays with trucks. 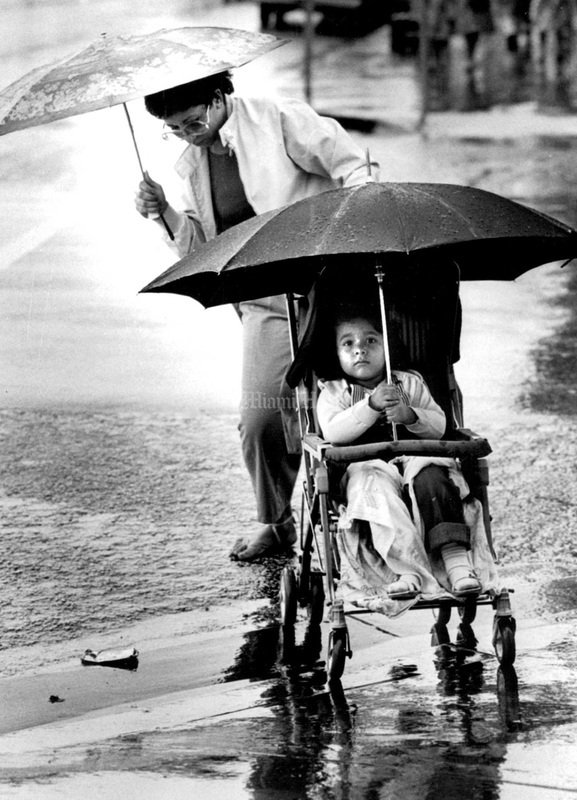 7/23/1985, Robin Shields/Miami Herald: Sonia Ortaz pushes her daughter Belinda, 2, down the sidewalk she said they just had to get out for some fresh air since they had been cooped up for too long since all this rain. 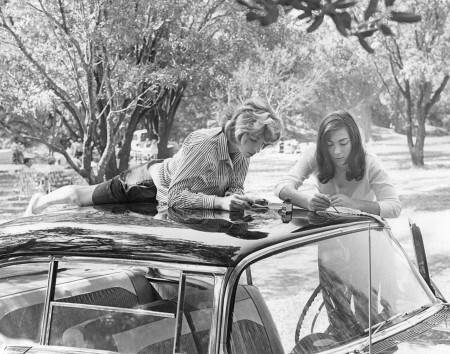 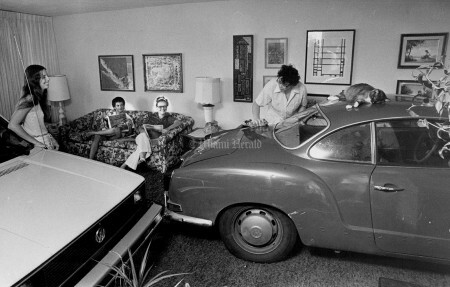 10/18/1964, Mark Peterschmidt/Miami Herald: Margaret Menter and Robin Wilk spotting car damaged by Cleo. 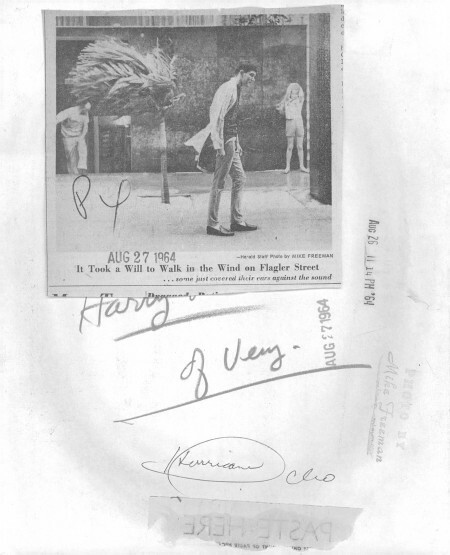 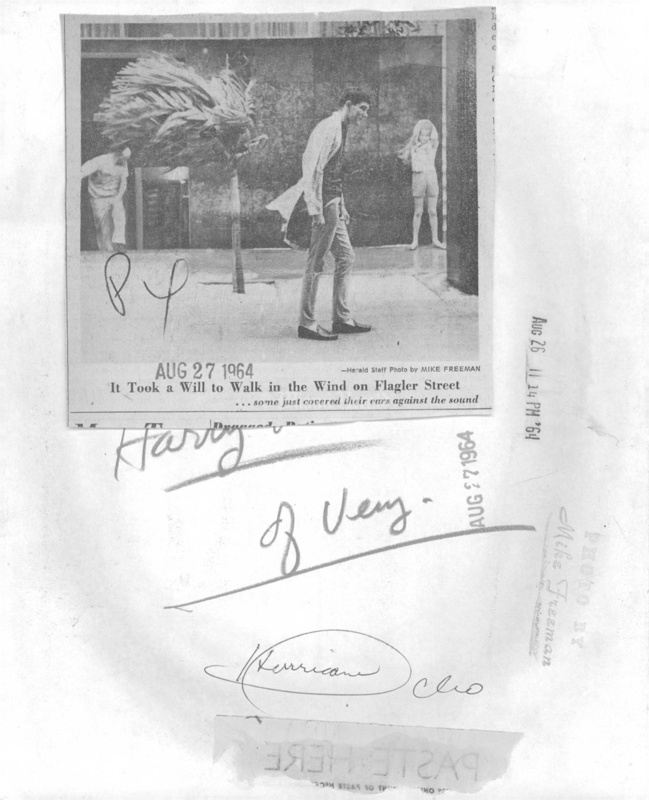 8/27/1964, John Pineda/Miami Herald: Hurricane Cleo. 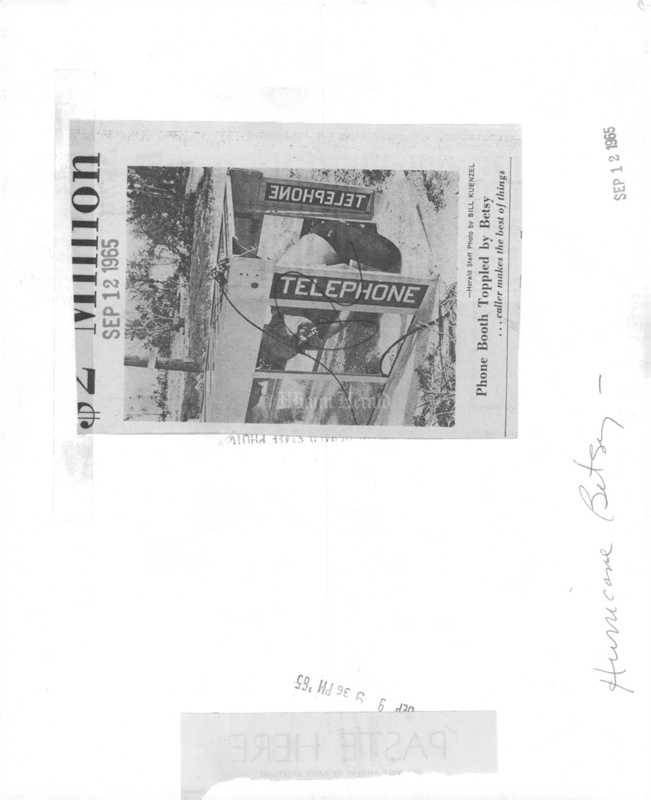 L to R: Gary and Glenn Brown in shopping center. 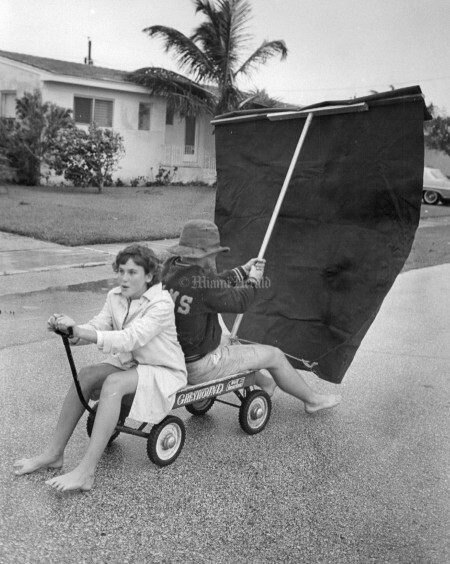 8/26/1964, Mike Freeman/Miami Herald: It Took a Will to Walk in the Wind on Flagler Street...some just covered their ears against the sound. 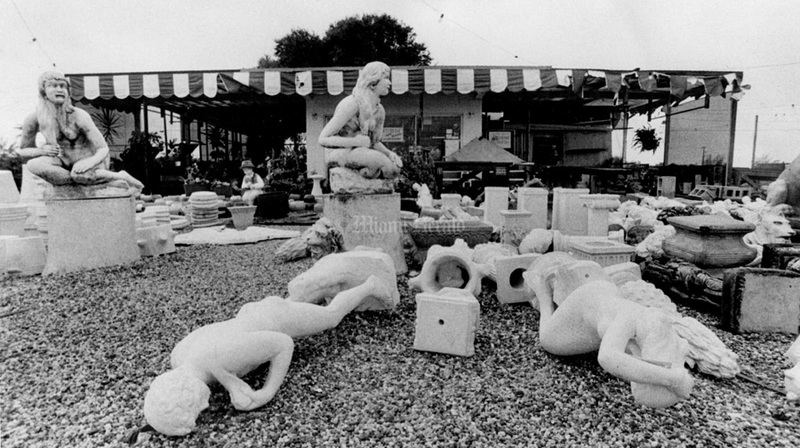 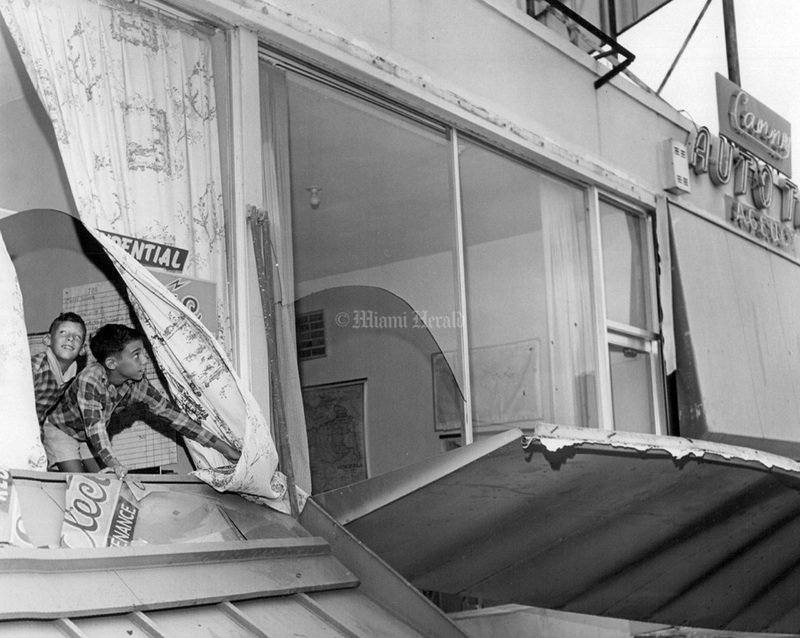 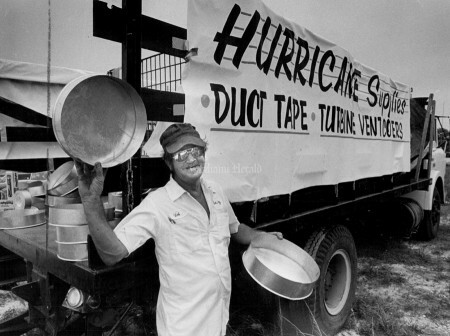 9/9/1979, Keith Graham/Miami Herald: Damage to Nick's Garden Center is Boca Raton photo taken Monday about 10 a.m.
8/31/1979: Storm Dealer (hurricane David). 9/2/1979, Murry Sill/Miami Herald: Magic Tours Travel Agency on Collins Ave., Miami Beach. 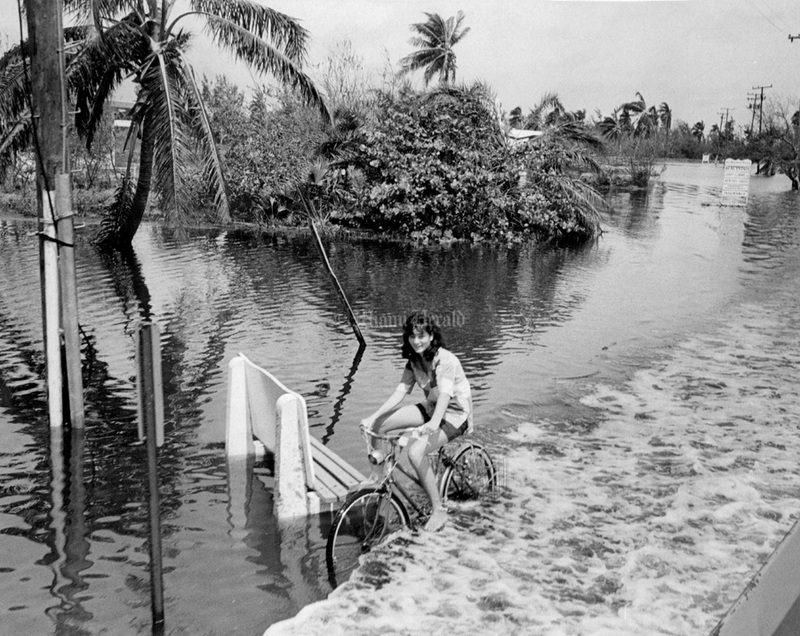 9/4/1979, Murry Sill/Miami Herald: Miami Edison Sr. High. Mr. & Mrs. Soloman Braun left Miami Beach Pine Tree Dr., Hurricane David Shelter. 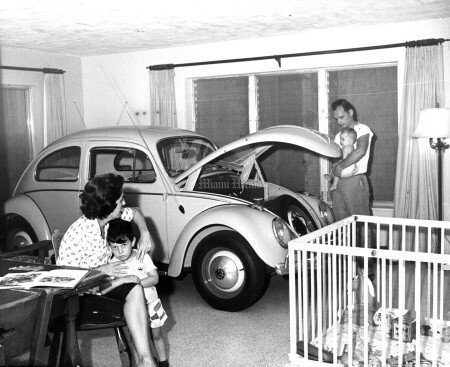 9/2/1979, Bob East/Miami Herald: When Mom has a new car and daughters car leaks, bring 'em in the living room for the storm - Sue Teal 17, neighbor A1 Osle who helped push them in, Trudy Tel who has the new VW at left and Jeffrey Teal 15 who polished while dry - Smoky the cat just enjoys at 3190 S'.V 118 Ave.
9/9/1960, Bill Kuenzel/Miami Herald: "Some day you will grow up and get to love it as I do" -- David K. Pearson. 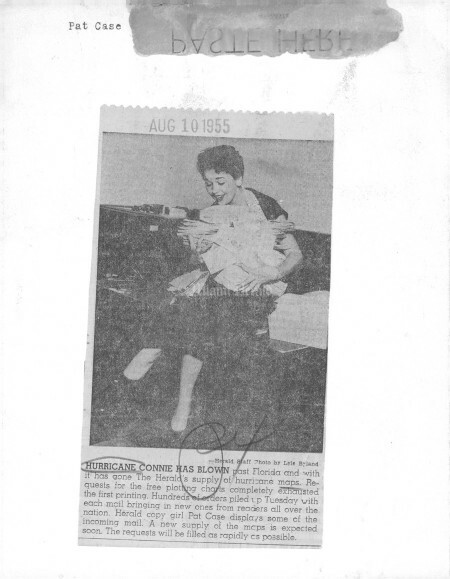 4471 NW 175 St holding daughter Carol, age 8 months, with Mrs. Pearson holding son Kelley, age 3.